One CR9011 Power Supply Module is included with each CR9000X, CR9000XC, CR9000, or CR9000C system, and the CR9011 is available as a replacement item. The CR9011 provides regulated power to the system from the internal battery modules. It also regulates battery charging from power supplied by the ac adapter, a dc input, or other external sources. 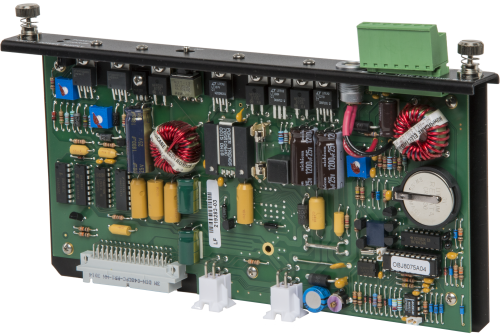 One CR9011 Power Supply Module is included with each CR9000X, CR9000XC, CR9000, or CR9000C datalogger, and is available as a replacement item. This module provides regulated power to the the datalogger either from the internal battery module(s) or from the 9 to 18 Vdc (fuse diode protected) charge inputs. The CR9011 also regulates battery charging (up to 2 A) from power supplied by the pn 8989 ac adapter, a dc input, or other external sources. The ac adapter may be used where ac power is available (110 to 240 Vac) to provide power to the CR9000(X)-series datalogger and charge its batteries. DC Charging 9.6 to 18 Vdc input charges internal batteries at up to 2 A rate. Charging circuit includes temperature compensation.